Sixteen-year-old Master Potioner Kyra had made a pretty good life for herself in the Kingdom of Mohr. After defying her parents’ wishes and becoming a potioner’s apprentice at age ten, she quickly mastered her craft. She set up the Master Trio of Potioners, and met her fiancé in the process. But after attempting to assassinate her childhood best friend, the Princess Ariana, Kyra has been forced to go on the run. Her former teachers, business partners and the entire King’s Army are all out to get her. With nowhere left to turn for help, Kyra makes an uneasy bargain with master criminal Arlo Abbaduto, who provides her with the means to track down the princess, who has gone into hiding. Accompanied by her pet pig, Rosie, and a strangely persistent young man named Fred, Kyra sets out to save the Kingdom from certain doom which only she can prevent. 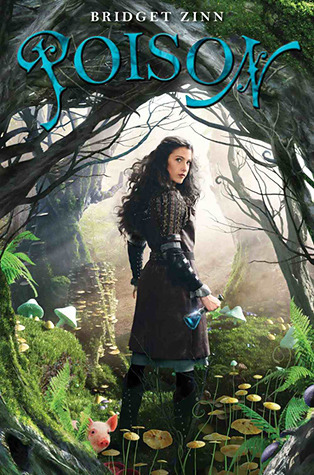 More fairy tale than fantasy, Poison is a whimsical, irreverent romp through a classic magical kingdom. Although the publisher has recommended this novel for grades seven to twelve, I would suggest it for readers at the lower end of that spectrum, as well as upper middle grade readers. While not without its surprises, Poison may be a little too predictable for older teens. Fortunately, Zinn’s saucy and impertinent attitude and her willingness to make fun of the clichés and conventions that make the plot predictable ultimately save it from itself. Despite the potentially dark premise—what if you had to kill your best friend to save the world?—Poison is much more humour than drama. I suspect that The Princess Bride was a strong source of inspiration for this novel. Although it was not my cup of tea, I would recommend it as a fun read for readers in the 10-14 range. My blog has recently been added to Book Review Blogs, which is part of one of the largest networks of blog directories on the Web. Please visit my blog’s personal page to vote for my blog and comment to other blog users.